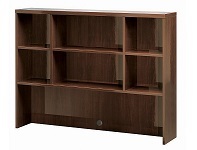 Extend your working area above your desk with a Scandinavia Inc. New Orleans hutch options. Some of our hutches feature adjustable shelves, a choice of glass or wood doors, and organizer inserts. Functional and space-saving, our desks with hutches are the ideal solution for homes and businesses with limited office space! Hutches use vertical space, leaving a small footprint, to effectively organize your office accessories and keep a organized look in the home or office.